Desarai Meyer, Des or Desi as her friends call her grew up throughout the Midwest and East coast in places like Indiana, Illinois, Pennsylvania, Colorado, Oklahoma, and she currently resides in Texas. When Desi isn’t on the mats, she works as an administrative assistant for a surgical center or you will find her enjoying the great outdoors. She says she loves paddle boarding when the weather is nice. Sometimes, her dog will accompany her. On those lazy days she enjoys Netflix and video games. She also lifts weights regularly, paints and draws, cosplay, reads, and dances. At the moment, Desi says she really want to travel and train in multiple countries. She also wants to learn Portuguese, and take a BJJ vacation. She is a purple belt at RCJ Machado Jiu Jitsu Farmers Branch. She has been training for five years. Her journey began when she lived in Oklahoma. One day she decided that she wanted to learn judo, so she signed up for a week trial at Triton Fight Center. 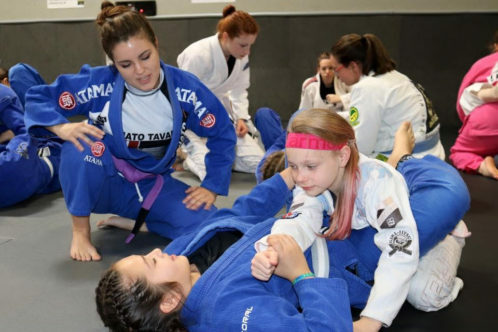 After doing a judo class, she tried out their Jiu Jitsu class and fell in love. The rest is history. We all have idols in BJJ that help to motivate us and that we look up to. According to Desi Renato Tavares and Piet Wilhelm are some of her idols because they set a great example of following your dreams and being able to accomplish anything you set your mind to. She also adds Carlos Machado to that list because the techniques he teaches are mind blowing. She also lists Gina Franssen and Jennifer Gray because she really loves strong women that empower other women and one that are unapologetic for being themselves. Desi considers herself lucky as she gets to train with some really great women all the time at her academy. She says training with both men and women is definitely an advantage. For women she says our body mechanics, sizes, strength, and techniques are usually very different from the men. What works well against the men, may not work as well against the women, and vice versa. According to Desi, if you get to train with both, you are constantly having to adapt. She thinks that you plateau less when you’re constantly being challenged with so many differences from one training partner to the next. She goes on the say. She had some great advice for a beginners saying that Jiu jitsu is for everyone: every size, shape, color, age, gender. 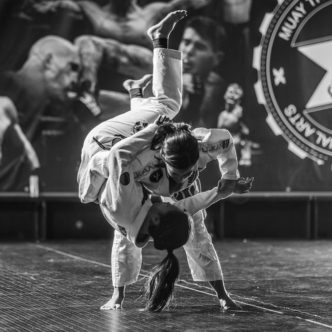 Anyone can train, and everyone trains for different reasons: self-defense, exercise, mental clarity, stress relief, hobby, competition, and probably a million other reasons. Shama Ko is a brown belt with Gracie Humaita out of Austin, TX. She has been a Brazilian Jiu-Jitsu practitioner since November of 2003. She is a photographer, writer, community organizer and activist. She heads the Girls in Gis organization or as she calls it the “movement”. She describes herself as both a lover and a fighter. She loves to laugh and not take life too seriously.